Our gondolier is in a chatty mood. Canzone has met enough Indians to say namaste when we clamber board. Within minutes our heavy lunch, his descriptions of the passing landmarks, and the gentle rocking of the boat lulls us into mild drowsiness. Then, a voice booms: "O Sole Mio". It's Canzone, living up to his name (it means 'song' in Italian). Tourists stop along the canal and whip out their cellphones. Canzone's smile broadens. He clearly loves a performance. Switching pace he hits a peppier number, accompanying it with foot stomps and claps. "Vooolare...," he sings, drawing out the first syllable of the chorus for theatrical effect. All this feels like Italy, but it isn't. In fact, we're 5,500 miles from St Mark's Square and Canzone is really John, from America. Also, our boat isn't on Venice's famous Canal Grande. It's drifting along a replica inside the Venetian hotel in Macau. This story begins in late 1996. Gambling billionaire Sheldon Adelson had just broken ground for a new Las Vegas hotel. His wife Miriam had suggested he model it after Venice. It was her favourite stopover on their 1991 honeymoon across Europe. Adelson, ever the charmer, tells us he thought of it as "a Taj Mahal for my wife". By the early 2000s, Adelson was outgrowing the city that made him one of the world's 20 richest men. 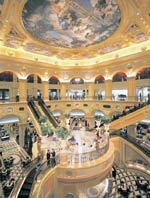 He began planning a rival to the famous Vegas Strip on Macau's swampy Taipa Island. The new Cotai Strip's first hotel, he promised, would dwarf the Venetian itself. The spa is run by the exclusive Malo Clinic. He delivered on his promise. 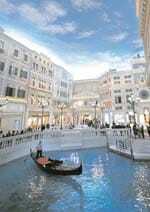 The Venetian Macau is twice the size of its Vegas sister. It has 10.5 million sq ft of floor space, more than one million square feet of meetings and exhibition space, 3,000 rooms and the world's largest casino. The ostentation begins on arrival. High-rolling guests never wait at the lobby. They are ushered to a discreet VIP check-in lounge. Here, the formalities take care of themselves as the guests enjoy gourmet snacks in relative privacy. Adelson calls the Venetian a MICE resort. That's hotel industry talk for Meetings, Incentives, Conventions and Exhibitions. In other words, this hotel can host everything from a team offsite to a rock concert. Besides the 108 meeting rooms, there's a 15,000-seat multipurpose arena and a 70,000 sq ft, three-story high ballroom. Despite the Venetian's MICE tag, the real action-and most of the hotel's business-happens in just five per cent of the area. The casino has 850 tables, 3,400 slot machines and half as many security cameras. In 2010, 83 per cent of the hotel's revenues came from here alone. A back-of-the-envelope calculation derived from Adelson's company's financial filings shows that that 83 per cent works out to $1.99 billion. To put that in context, the Venetian cost $2.4 billion to build. Gambling is so popular it may have even cost the Venetian one of its main attractions. A resident production here by the world-renowned Cirque du Soleil performing group shut down this February. The guests, it seems, preferred chance to dance. The suites are as impressive as the rest of the hotel. His & hers washbasins, a sunken living room, multifunction printing devices and big screen plasmas are standard. The smallest suite measures 700 square feet. The largest, the Presidente, has four bedrooms. Unfortunately, the Venetian's mammoth size is also its biggest drawback. One member of the staff joked that he's never needed a gym plan. But this is common to Vegasstyle hotels. They rely on diverse attractions to keep business flowing through the year. The hotel has very thoughtfully created a giant mall on the third level. Shop, duty-free, from Armani to Zara and that's just the fashion section. There are 17 categories in all, including electronics, cosmetics and jewellry. Also on level three, you'll find some 30 restaurants covering every conceivable cuisine (including Indian) and price point. The 75-odd entertainers who double up as gondoliers and bards come from all over the world. Canzone, aka John, grew up listening to opera on his dad's stereo in the Philippines. In San Francisco, where his family moved when he was 10, he continued that passion with theatre. When he heard about auditions for the Venetian, he applied. The judges found him a perfect fit. The Venetian, through the Malo Clinic, also offers some of the world's best spa services. Paolo Malo, the founder, earned fame across Latin America and Iberia as a cosmetic dentist. Not surprisingly, clients line up not just for therapeutic massages but also innovative plastic surgeries. During your visit keep track of events at the Cotai Arena. If you're lucky you may catch performances by international popstars such as Lady Gaga, Beyonce, or Rain. Sometimes, the arena even hosts exhibition games between NBA basketball teams, tennis matches with stars like Rafael Nadal, or even boxing, dirt bike racing and ice skating events. Despite it enormous size, service at the Venetian is surprisingly responsive. The 15,000 employees ensure a 3:1 staff-to-guest ratio. My visit coincided with a particularly busy weekend. The hotel was hosting Bollywood's annual Zee Cine Awards and it was also Chinese New Year. I wasn't expecting personalised attention. Even so, when I found myself without water at 12:30 one morning, room service had six bottles delivered within 25 minutes. Bear in mind, this was a gigantic hotel running at 100 per cent occupancy. In fact, there are so many waitresses, chefs, bellboys, security guards and blackjack dealers, the Venetian runs a mini city behind the scenes just for them. Here, they have their own McDonalds, a bank branch, and a 7/11 store. There's even a cybercafe where tired staffers recharge on Facebook or with videogames. Although there are no direct flights to Macau from India, it's just a one-hour ferry ride from Hong Kong. The Venetian's owners operate an exclusive CotaiJet ferry service straight from Hong Kong airport to Taipa; all part of the company's attempts to make it easier for guests. Brendon Elliot, who leads the Venetian's marketing efforts, says he wants to see more South Asians at the hotel. Some 145,000 Indians visited in 2011. He believes that number can hit 200,000 this year. "We're investing more in marketing to India than any other country," Elliot tells me. If all goes to plan, he may just hear more of his gondoliers piping in with a 'namaste'. One of the most popular restaurants at the Venetian, it specialises in non-vegetarian fare. The sushi is excellent as are the oysters, prawns, escargot, fish and assorted dimsum. Chefs here prepare traditional food from China's Dongbei and Sichuan regions. If you love spicy fare, this is a very good bet. Located in the middle of the casino, this restaurant serves quick, affordable meals. Most dishes feature some form of noodles. Here you will find traditional Italian food and a well-stocked wine cellar. While the pizzas are filling, portions for the rest aren't as generous. Popular for their breakfast spread, the restaurant has a wide buffet ranging from Chinese staples to good ol' stuffed omelettes. Daily flights from Indian metros to Hong Kong. Take a ferry to Macau from the HKIA Skypier or from downtown Hong Kong. Indians are granted a free, 30-day visa upon arrival in Macau.